Converse makes everyone feel like an All-Star. 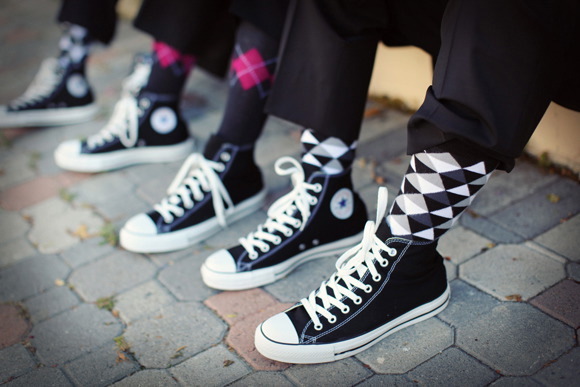 A Converse-inspired wedding? Count me in! Being part of the Jewish Wedding universe means lots of Shanah Tovah-ing this time of year, plus the added bonus of stumbling across some truly incredibly wedding pictures. Check out this awesome wedding we found with awesome California-nerdy style—we love it! (There are more than a few members of our collective who call ourselves nerdy and artsy, so we reserve the right to use it without offense!). 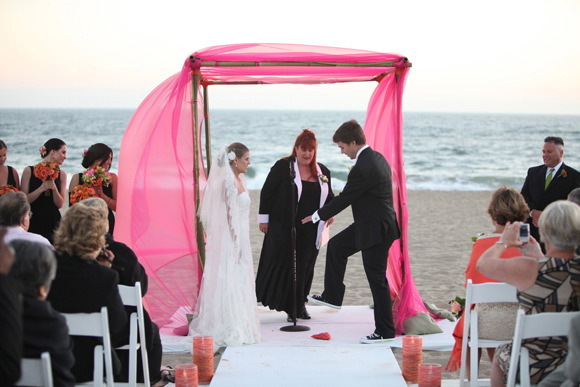 This picture says so much about everything This Is Not a Ketubah is about—from the laid back Converse style to the incredible color of the Chuppah and the progressive ceremony—we couldn’t wait to share it. Thanks to Allyson at The Wedding Yentas for sharing this! Ashleigh and AJ’s wedding reminds us that a modern Jewish wedding calls for a modern, cool, colorful Ketubah. Though we haven’t gotten a look at the Ketubah these two signed, we know that no matter their observance we would have loved to provide a gorgeous text to match the vibrant colors and bold style and funk these two have. From interfaith and progressive Ketubahs to traditional orthodox ketubah texts, we’re happy to include your family information right into the text! And even though this couple was straight, we can imagine an equally thrilling and fun gay or lesbian wedding. Since we appreciate love in all its forms, we’re happy to offer a queer ketubah enclosed in drop-dead-gorgeous art. The idea that Jewish weddings and their Ketubot need to be stuck in the 18th century isn’t what we’re all about. Instead, we strive to bring designs inspired by the best modern artists from the 20th century for your dream wedding in the 21st. The best ketubah ever? With the right couple, we want to make it happen!